Welcome to the Wasteland. Where all the adults are long gone, and now no one lives past the age of nineteen. Susan Kim and Laurence Klavan’s post-apocalyptic debut is the first of a trilogy in which everyone is forced to live under the looming threat of rampant disease and brutal attacks by the Variants — hermaphroditic outcasts that live on the outskirts of Prin. Esther thinks there’s more to life than toiling at harvesting, gleaning, and excavating, day after day under the relentless sun, just hoping to make it to the next day. But then Caleb, a mysterious stranger, arrives in town, and Esther begins to question who she can trust. As shady pasts unravel into the present and new romances develop, Caleb and Esther realize that they must team together to fight for their lives and for the freedom of Prin. The first time I got a glance by this cover, I was instantly intrigued. There's just something about it that caught my eye. I wasn't sure what to expect from this book, but that was quite alright. Hermaphroditic outcasts and a mystery were sure to keep me interested. Esther was a different girl compared to the rest of the inhabitants of Prin. She didn't mind the Variants and did not agree with the ways of how they were ruled by Levi. She wasn't mindless and subordinate like her sister and tried her best to stand up for what she thought was right in her own way. Sadly, I didn't really create that connection between reader and character with her. I liked her--didn't mind her or anything--but I didn't feel like I'd care either way what happened with her, unfortunately. However, I really did care about this story. I got invested in the story and couldn't wait to see what would happen next. So unpredictable! I can't say that I'm a master at figuring the plot of a book out, but I can easily recognize when a story goes generic. So in Wasteland, I couldn't figure anything out. I had no idea what these authors had up their sleeves when writing this book. I was surprised over and over again. I truly loved this story! My only major problem about this book would be the writing style. I've read some pretty complicated writing styles--yet loved it--but for some reason, this book's writing style confused me! I didn't understand why it would keep tripping me up and I would then get frustrated at myself and then I'd have to distract myself because I wasn't able to read when I was all upset. I'm not saying that the writing was bad; it was just different. 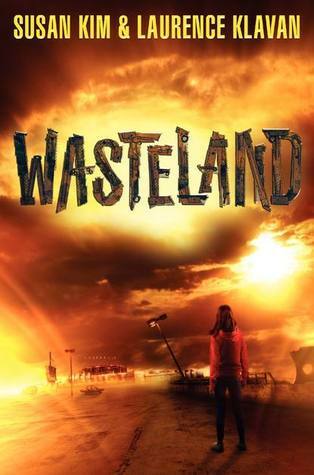 Wasteland was a gritty and unpredictable read about what people will do for survival. This post-apocalyptic read featured a tyrannical evil dude bent on manipulating others for his own gain. Besides the lack of a relatable character who I thought to be too childish for her age and the writing style, this book was good! The story was so original and I had to keep reading to see what would happen. Turns out, Susan Kim and Laurence Klavan are master plotters. I may just like them a lot. Fans of dystopia, post-apocalyptic, and awesome plots will possibly enjoy Wasteland. Millie, I'm so glad you read & reviewed this book because this is the first review of this book that I've seen at all! I love the sound of the concept for this book, it seriously sounds great! I'm glad to hear that the authors were able to pull it off. I'm a bit worried about the writing style that you mentioned though. I hate it when I'm not able to connect with the character on an emotion level! :( Anyhow, thanks for your great review, Millie! Ooohhh, I passed this one up on Edelweiss because I wasn't sure about it. But the fact that it's unpredictable makes me kinda want to get it! I love a book that can keep me on my toes. Hopefully I won't have a problem with the MC! Great review! I am starting to want to read this book more and more. I like post apocalyptic books and I hope that it doesn't confuse me as much.